Why a feeding station? Well, for starters it stops clumsy dogs from spilling their dish every 2 minutes. And many of these stations double as food storage, so it keeps things clean, tidy, and organized. Not to mention they just look beautiful. 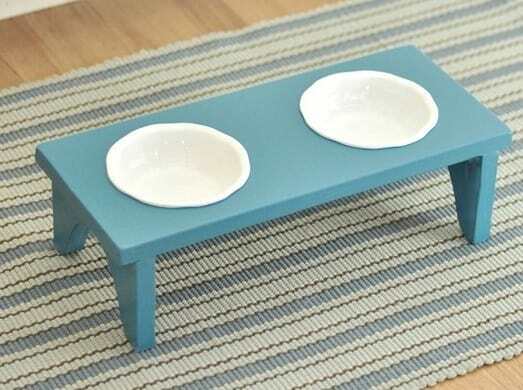 And some argue that elevated bowls is a more comfortable and natural way of eating for your dog as well. The great thing about our list of feeding and storage stations is they all come with instructions on how to actually build each one. That being said, you'll need tools and some handy skills, but if you're feeling ambitious then these are really fun home projects. 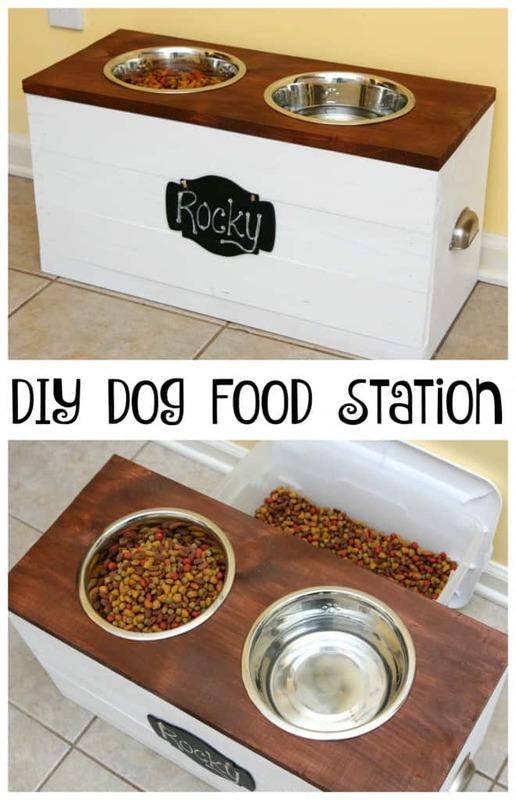 And if you're looking for even more DIY projects for your dog, check out this link. 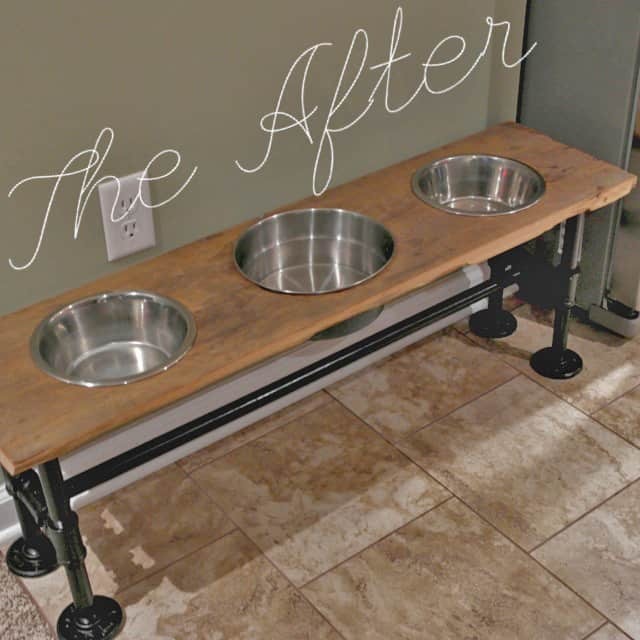 Addicted2DIY has created an masterful piece that your dog would be proud of. As they would tell you, the best feature of dog food stations is not having clumsy dogs knock over the water dish and make a mess. 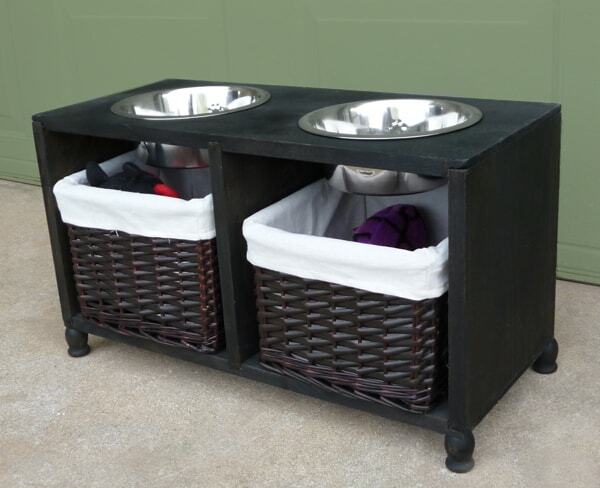 It also acts as a storage chest (hinged on top) to conveniently hide away dog food. Looking for something a little more simple and elegant? 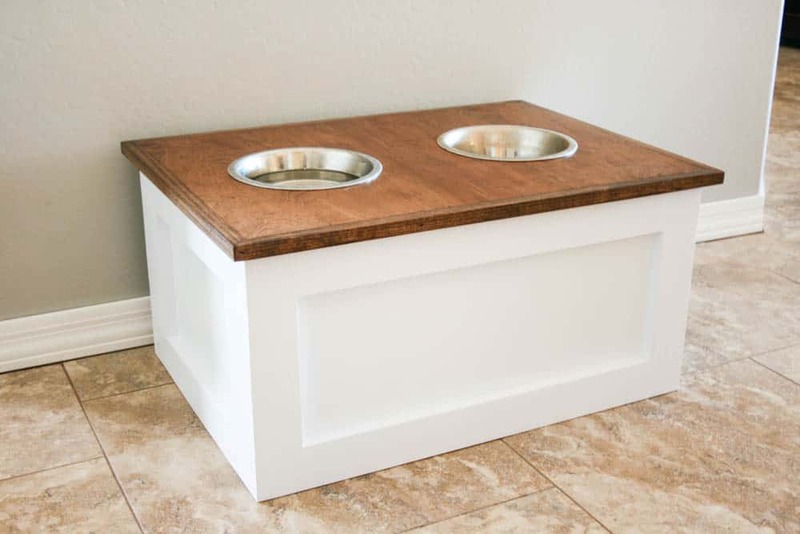 Perfect for small dogs and made for under $15 of materials. You'll need a jig saw and a little elbow grease with some sandpaper, add a little paint on you're done. 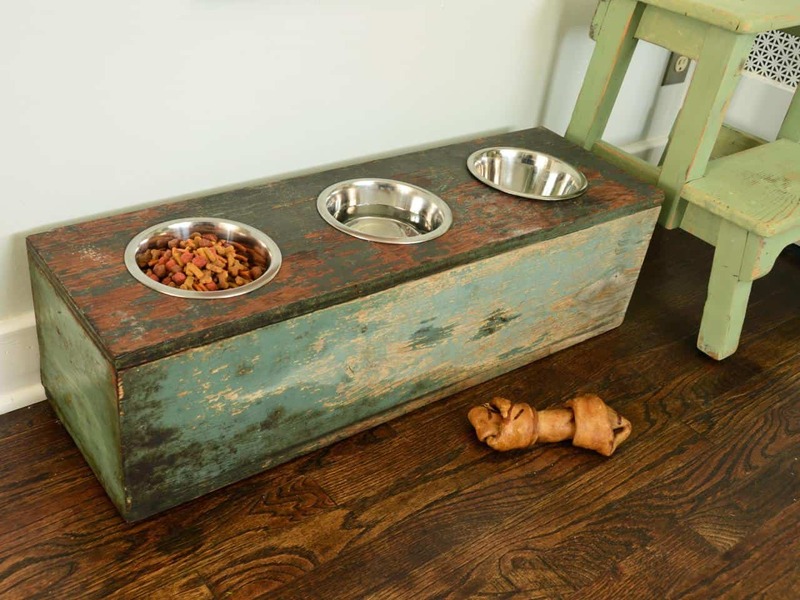 If paint isn't your style you can go for a more rustic look and stain the wood on your feeding station. I would describe this as absolute brilliance, reallifedog over on the DIY subreddit forum has created a feeding station out of a vintage suitcase. 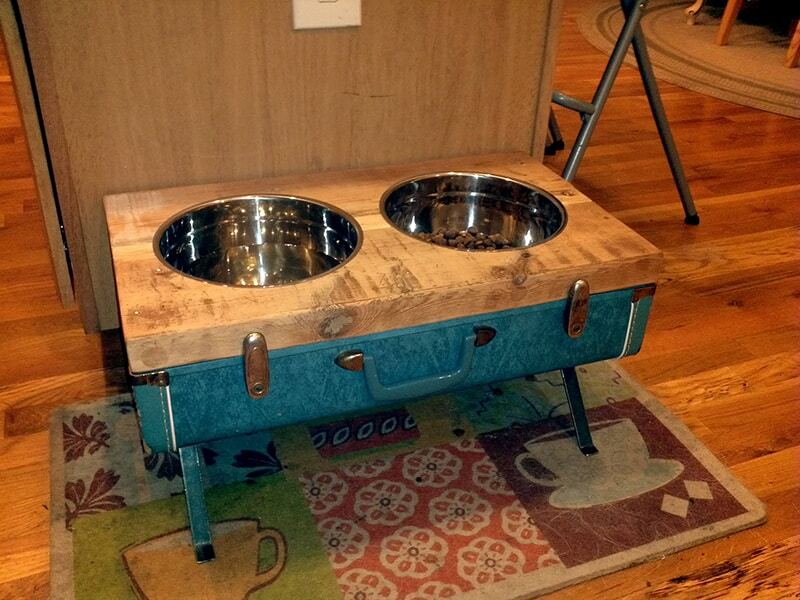 He then used aged wood to create the "counter-top" which holds the dog bowls. The end result is a very unique and beautiful station that I think most art collectors would be jealous of. 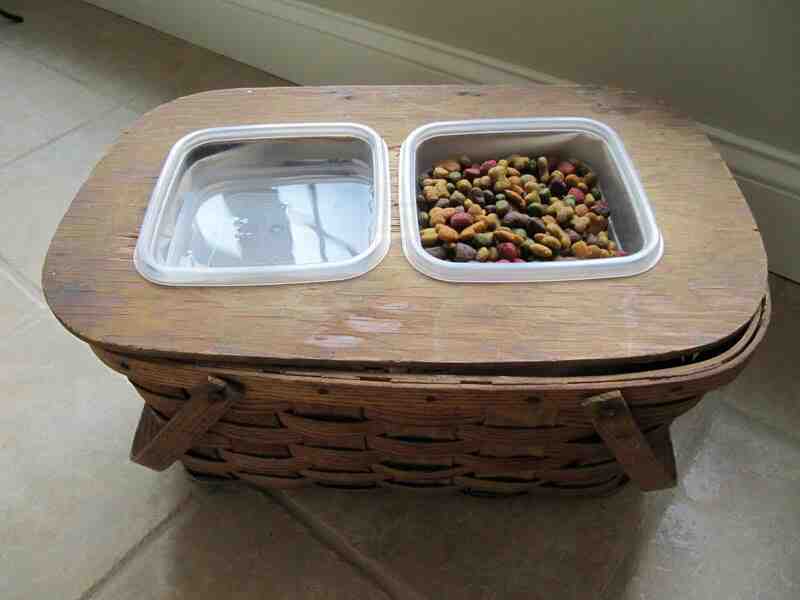 This food and storage station a little easier to make but still just as beautiful and practical. That's because this is a standard shelf you can buy for around $24, which was simply cut out to fit some bowls and given a layer of paint. The really clever part is the stands at the bottom - those are candle cup holders painted black and screwed into the bottom. I love this idea - a simple "feeding shelf" that fits in perfectly with the rest of your kitchen, and so easy to make. Just use a jig saw to cut out circles from some step-tread (wood that's already finished), and find some really cool looking corbels (depending on how fancy you want to get). This reminds me of a little pallet found in a warehouse, but painted just the way you like. 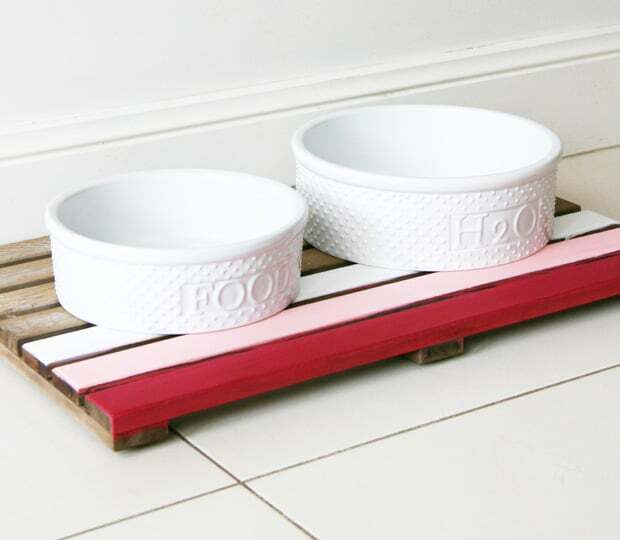 Serena over at PrettyFluffy.com used some old duckboard (small wooden slats generally used as passageways over muddy water) and created a unique feeding station that's very budget friendly. SewManyWays found a picnic basket as a consignment shop for $2, and came up with an idea. 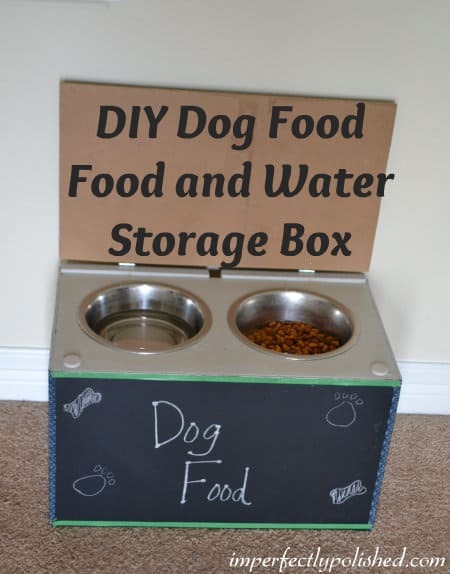 Using two plastic containers, a jig saw, and a little creativity, Karen created a fun food station that takes about 15 minutes to create. It just goes to show that a little imagination can go a long way to creating something beautiful and practical. If you're going for the more modern look and don't want to spend a lot, this might be perfect for you. 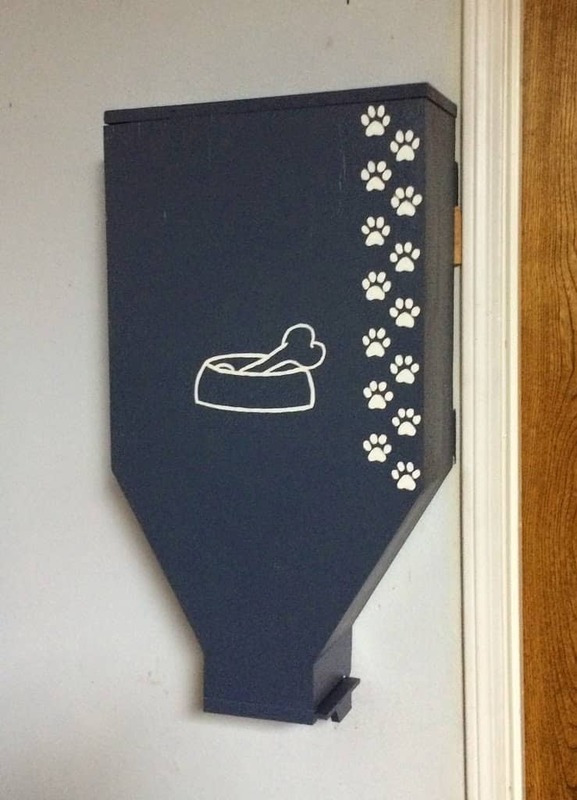 Molly at AlmostMakesPerfect.com made this little station for her cats, but it works just as well for small dogs (or can be scaled up in size). 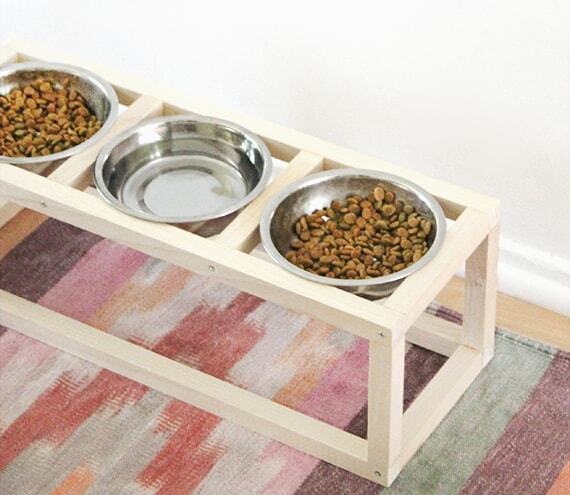 Just some screws, glue, and wooden dowels and you can create a very artful piece that your furbabies will appreciate. 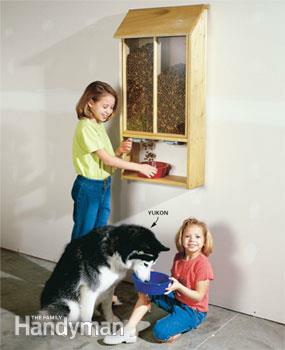 A dog food dispenser.. Why didn't I think of that? I'll admit, this is a little bit more of an ambitious project, but the outcome is pretty cool. That being said, don't mount this dispenser too high or once a month you'll have a tough time loading it up. What I love about this little food station is it looks like a toy box, and the chalk board just makes it even more fun, while making it look something from a rustic restaurant menu. I can honestly think of a hundred different cute things I would love to write on that chalk board. The other nice feature is the closing lid that's hinged on top. 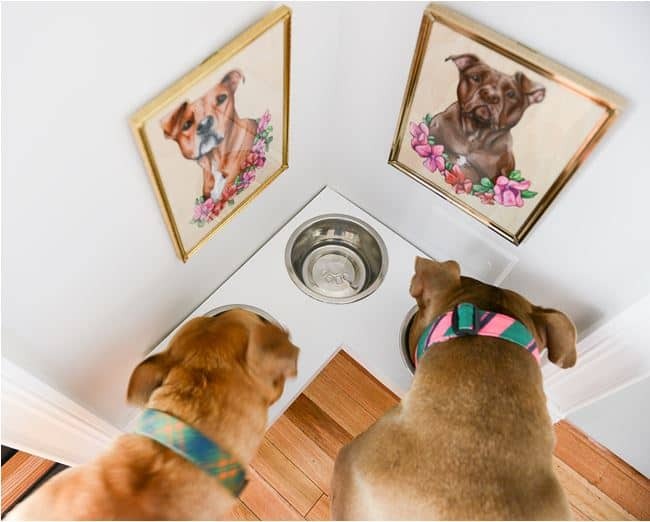 We're back with another wall-mounted dog food dispenser, but what's great about this one is it's accompanied by a YouTube vid to make it easier to follow. Compared to some of the other projects on the list, this one is quite ambitious. But if carpentry is your thing then this would be a ton of fun to create. 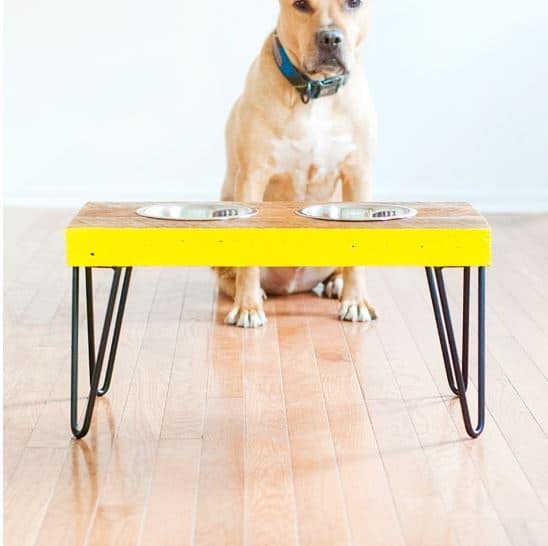 Does your dog require a little more elegance when eating? 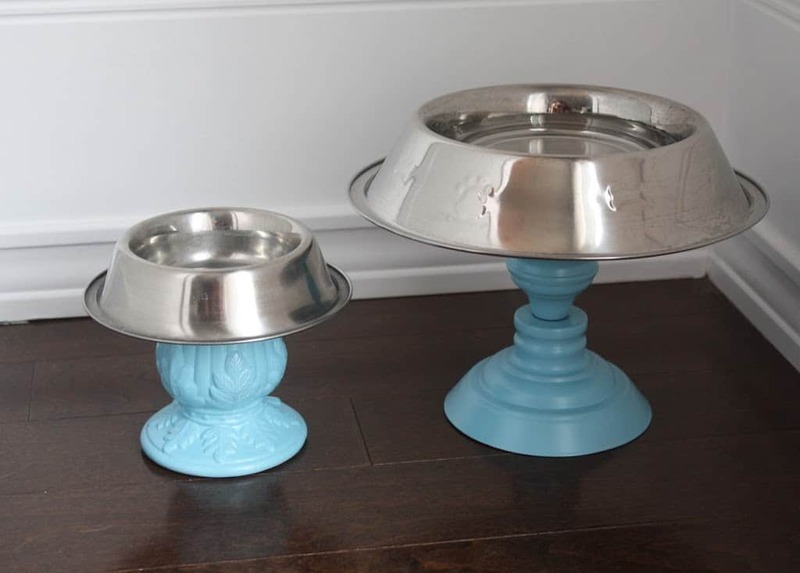 How about candle stick holders to uphold the finest presentation for your dog's entrée? What's great about this creation is how dead-simple it is to make. Find some big and stable candle stick holders, paint to desired color, glue to the bottom of the dish - Done! Again, I love this idea, going for a rustic and industrial look that may look complex but is not difficult to create. The steel is already pre-threaded plumbing pipe that puts together very easily. So all you really need to do is cut holes out of a plank, paint, and screw it together. A corner piece that looks neat, and saves room. It's another one of the moments where I say "why didn't I think of that?" 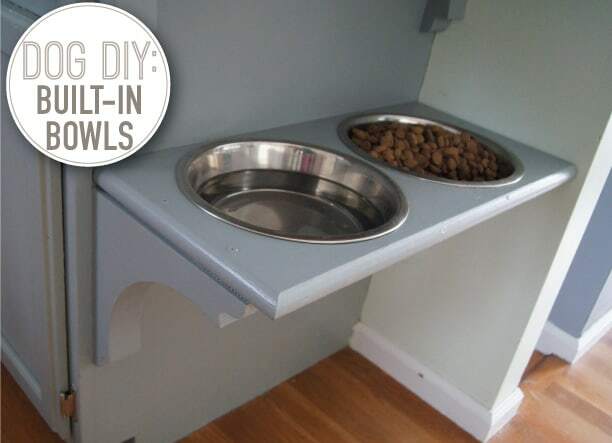 This feeding station is as easy has hanging a shelf (because that's essentially what it is). You'll just need to make the shelf and cut out some holes first. Not bad for about $25 worth of materials. Yellow Brick Home is on a roll here, because they made another cool feed station. This time using artful hairpin legs as the stands, which gives it a very modern look. After that it's the usual - find some cool looking aged wood, cut out some circles to fit your bowls, add some paint (if you want), and you're all done. Another storage chest/feeding station that looks like it would fit into any home. Kara at Happy Go Lucky blog didn't leave out any details - there's handles on the side for easy transport, a beautifully stained counter top, and even a piece of chalkboard with her dog's name (in case he wasn't sure if it was for him). Now this is rustic! If you're going for the real aged look then this pretty much it, but you'll have to go on a mission to find some old wood. Not only that, but the wood needs to be just the right size (or can be cut the right size) according to your pets height. You may consider taking apart some old found furniture as well. But you need to make sure it's pet friendly, remove old nails, ensure the paint doesn't contain lead or harmful chemicals, and remove any chips and sharp edges.